http://www.vladtv.com - Billy Danze explained what it was like when Roc-A-Fella Records broke up while M.O.P. was signed to the label. The rapper says that both Jay and Dame offered them tons of money after the split, but Billy says he felt uncomfortable about choosing sides. After "falling back" from the Roc, Billy says that he courted a possible signing with G-Unit. The NY rapper says that while he appreciates 50 Cent for letting his group tour and hang out with them for a year, the label deal didn't quite work out. 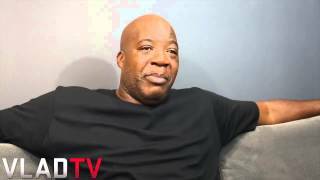 M.O.P.’s Billy Danze: Roc-A-Fella Break Up Was Uncomfortable. SHARE ON: admin — January 3, 2015. ... but Billy says he felt uncomfortable about choosing sides. M.O.P.’s Billy Danze: Roc-A-Fella Break Up Was Uncomfortable. KUDU News | January 4, 2015 | Kudu! ... but Billy says he felt uncomfortable about choosing sides.